The Employee Payroll Tracker is the optimal way to start tracking the financial information of your employees and give yourself the freedom to get back to what’s important. This simple, yet efficient, document allows you to track of as many employees as you want and log their financial information. You may list everything from the hourly wages to the percentage they put aside for their 401K. You will see how simple this makes your daily paperwork, as you look up all these important details with a click of your mouse. 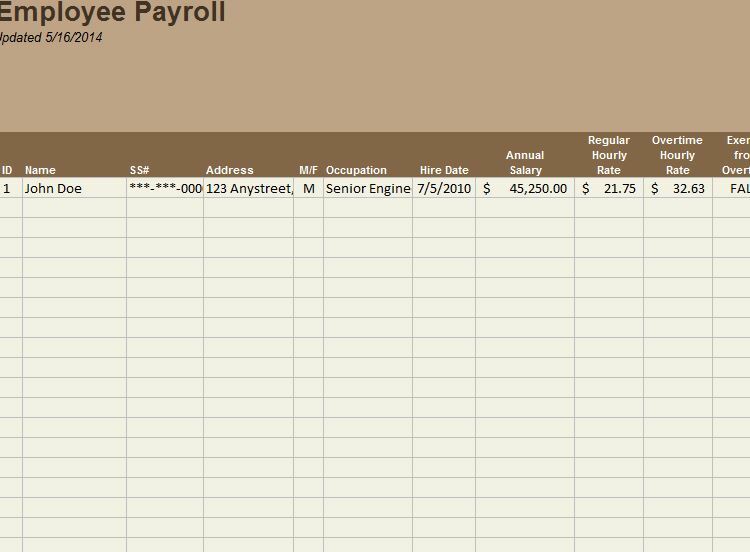 Read more information about this free payroll template below. After you have successfully downloaded the template to your computer, you will begin editing the document for you own needs. Each row is where you will enter a new employee and each column is where that employee’s information will go. The first row has an example so you know exactly what goes under each category of the columns. If you follow the example, the first step is to list the employee ID number, the name, SSN, address, and their various other information listed in that first row. Once you entered the financial information, the items that generally don’t change, for each person on this tab, you can continue to the “Pay Roll” tab located at the bottom of your screen. This section is more for listing the salary/payment information for your employees, instead of their confidential info you listed in the previous tab. Here, you’ll enter their wages and PTO as well. This will make your system much more efficient, allowing you to access each employee wherever and whenever you need it. Taking care of your employees and their payroll information has never been easier with the Employee Payroll Tracker. Download the free template today to get started.